Macnas collaborate with like-minded, imaginative organisations to bring original and extraordinary ideas to life. Macnas prefers to actively seek out support from interesting brands and businesses in tune with our vision. Sound like you? Contact the Macnas team on +353 (91) 561462 for more information. 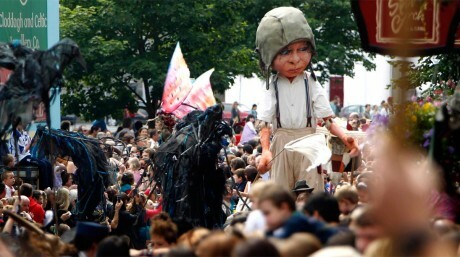 Macnas is proud to be funded by the Arts Council of Ireland and gratefully supported by Galway City Council. We are very thankful for the support of our parade partner The Latin Quarter, and for our golden business patrons Galway Clinic, Acorn Life and O’Connells Bar. In 2018, we began an exciting three-year partnership with Connacht Hospitality Group in support of the Macnas Young Ensemble and Macnas Drummers, who meet weekly to rehearse at our workshop. We look forward to what the next two years will bring.